Who does not want a perfect bikini line which can be flaunted. Now it’s time that you keep your bikini line in perfect shape and enjoy flawless body with the bikini trimmers. It’s way too safe and easy to shave , trim and get a style the hair down there. For sure you will enjoy your silky smooth skin. Keep all your worries and tension aside of skin irritation, nicks and cuts. Because I can assure you that you will not get a single cut but you will enjoy the process. So, here we 10 Reviewer’s Team have brought to you some Bikini Trimmers for you whose results will surely get a smile on your face. 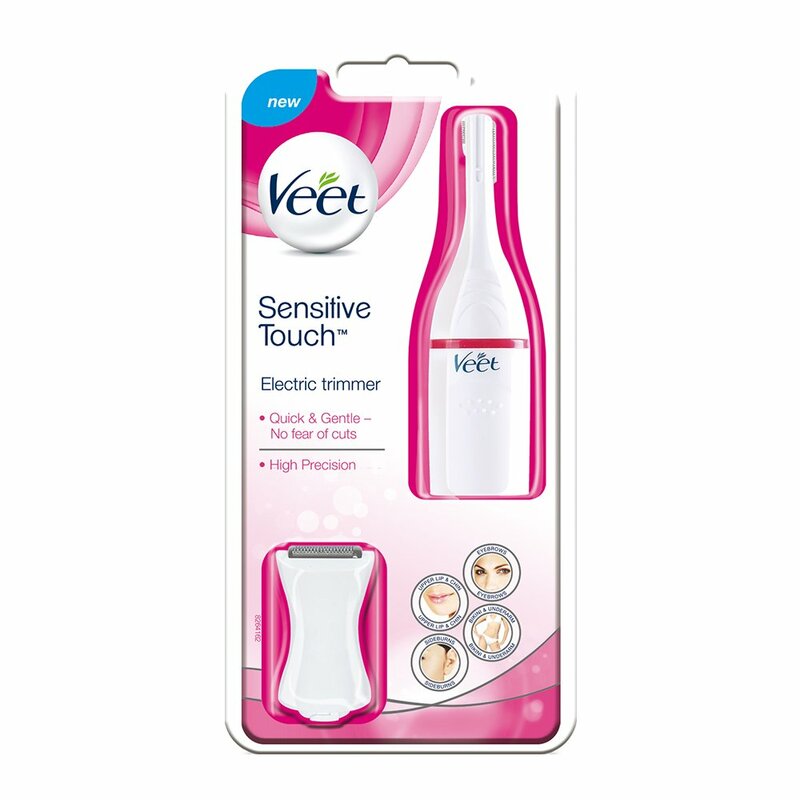 This beauty styler Bikini Trimmer By Veet has been specially made for women , so that they can use it at their sensitive body parts. Not just bikini line, you can also use it upper lips, side burns and eye brows. It is quite precise and easy to handle, removing hair gently without any direct contact with the skin. So , there is no chance of nicks and cuts; the hair will be removed easily with just one go. You will get many attachments with this; 1 precision head, 1 bikini head, 2 combs, 1 beauty cap, 1 cleaning brush, 1 beauty pouch and AA battery. Ergonomic design of the trimmer makes it easy to hold with a firm grip. For gently shaved and shaped bikini line use the larger head. Use the trimmer on the opposite direction of the hair growth to remove hair with an ease. Don’t forget to add the comb and choose the desired length. Being compact and elegant is is a perfect travel partner. This awesome Bikini Trimmer by Philips will surely give you a safe and easy experience. The new Philips HP6382 Bikini Trimmer gives you the perfect bikini line with its advance features. 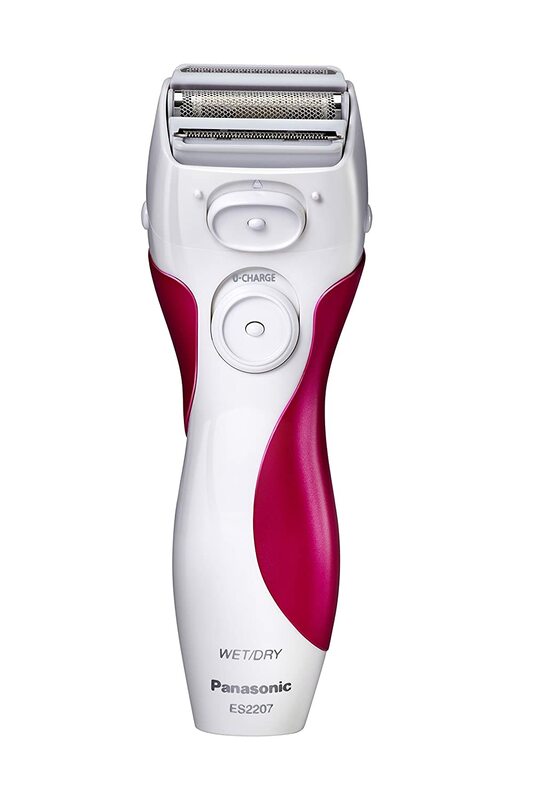 Rounded head of the trimmer ensures you safe and precise hair removal. It is powered by AA batteries, and hence can be used anywhere and anytime. With the help of mini shaver head you can get zero trim look. Ergonomic handle specifically designed for the bikini area assures you proper trimming around bikini line. With this there is no fuss, no hustle and you can flaunt your hairless bikini body anytime in beach. Simply place the trimming head onto the hair you want to remove and glide it against the direction of your hair growth. For best results, keep skin taut while trimming. You will get a 2 year warranty period from the date of purchase with this product. 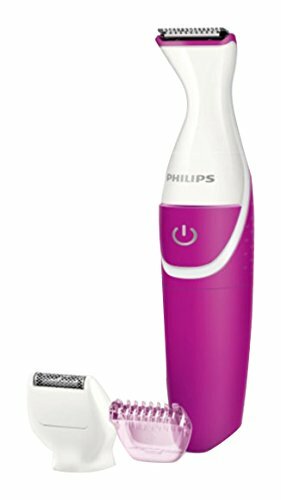 This Bikini Trimmer from Philips is just perfect for you if you travel throughout the world. You might be thinking why am I saying this? You can use this world wide anywhere just because of it’s dual voltage technology. It can be used in and out of the shower. Ergonomic Design makes the trimming process easy with easy navigation on and around the bikini area. Round teeth of the trimmer not only protects the skin while trimming down the hair precisely. Mini Shaving head gives you a zero trim look after trimming. You can change length setting by clicking on the comb. It is powered by battery for optimal portability. The head of the trimmer can be washed under tap. Not just this, but you will also get 2 years manufacturer warranty from the date of purchase with this trimmer. Even you can enjoy the silky smooth skin with this Panasonic ES2207P Ladies, 3-Blade Cordless Women’s Bikini Trimmer. This trimmer features the electric razor operation . You can use this in and out of the shower. . This Panasonic trimmer is fully immersible for shaving legs and arms. Also, you can shave it in the bath with later. It will do your work just perfectly.The hypo allergic women’s razor blades keeps the skin sensitive and comfortable while a the pop up trimmer lets you trim the longer hair along the bikini line. It will glide smoothly over your body for smooth results on legs, arms and underarms. The sleek and ergonomic design lets you to use this trimmer comfortably and with a control. 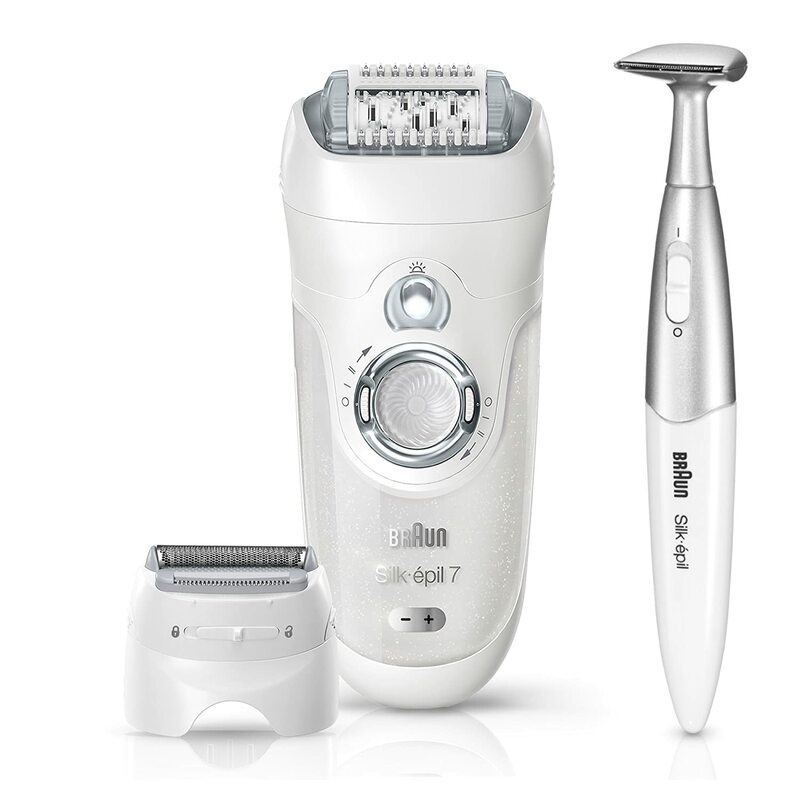 This is one of the most efficient bikini trimmer by Braun. Not just this you will also get an epilator with this. This removes the 4 times shorter hair than hair wax. 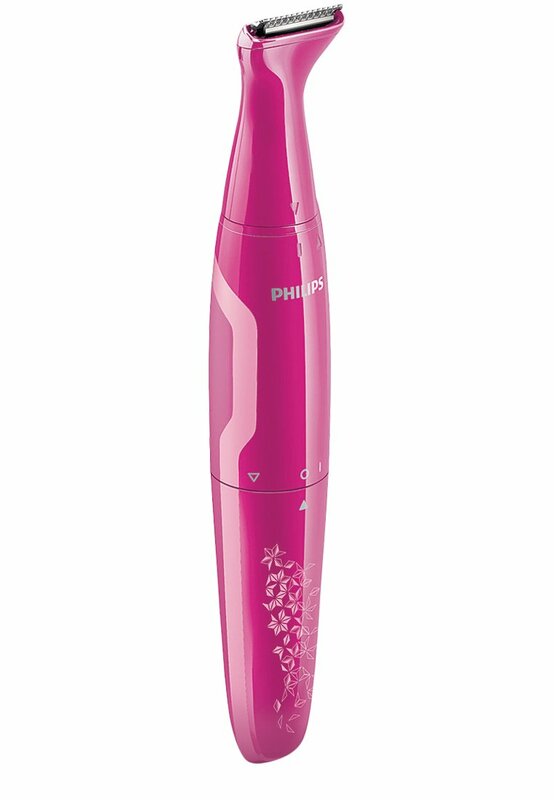 YOU will also get 8 extra attachments along with this including a shower cap, trimmer cap and an epilator. It tweezes the hair from its root providing you silky smooth results that will last upto 4 weeks. It has been designed with close grip technology. This trimmer is waterproof and can be used under shower also. This precisely designed bikini trimmer looks like a pen with rounded tips at it’s head which will protect your skin from any kind of nicks and cuts and also skin irritation. And hence no chance of getting worried for the redness caused by waxing.